On Edgar's day, a visit from the dead. 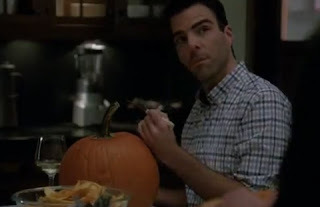 For a while now, I've been meaning to post about one of my favorite-- and one of the few I do watch-- television shows on the air right now: "American Horror Story." First premiering in October 2011, I caught the pilot simply because the show's name included the words "Horror Story." From the very first episode-- where the viewer is introduced to a house with a blood dampened past, and the family who is moving there during the present day-- I knew this was something special. As the second season of American Horror Story comes to a close tomorrow night, it is absolutely true that both seasons have shown us things we have seen-- often many times-- before. But what makes the show work so perfectly is the blending of American myth and horror legend that-- when put together in the hands of a talented storyteller, and immensely talented actors-- so clearly shows why these stories endure, and the urban legeneds and tales continue to scare viewers, readers and listeners. 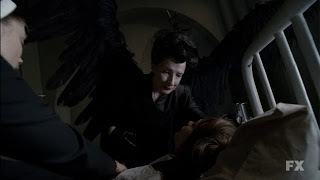 And often, as has especially been the case in this anthology series during the second season, we have numerous stories from American horror interacting with each other; in a way truly original, and never boring. The first season of "AHS" focused on one large house in California, the family who moved in and the community of past residents-- both living and dead-- returning to haunt the grounds. 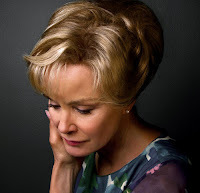 Anchored by the fabulous Jessica Lange as the next door neighbor Constance-- something of a rejected character plucked straight out of 1950's Americana, who would be at home in a number of horror stories-- the more than capable cast expolored a cornicopia of ghost lore and myth, and managed to create something fresh, and exciting. With this change, in my opinion, "AHS" has succeeded where John Carpenter was not so succesful, when he made "Halloween III: Season of the Witch" some decades ago as a depature from the story of the masked killer Michael Myers, and attempted to make the Halloween franchise about different stories with each movie. 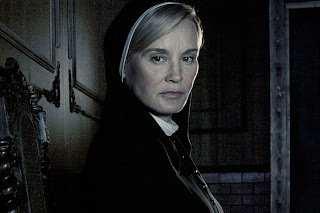 With "Asylum," AHS has given us a season of television as inventive and manic as the one which came before-- and beyond. While last season gave us the brilliance of Constance and her family of the living and the dead, this season has given us Jessica Lange in the role of Sister Jude-- the nun running an asylum for the insane while battling the demons of her past (and some very present and literal demons of her present); the inmates of the asylum; the perverse Dr. Arden and his horriifc experiments on the residents of the asylum; and those who haunt the skies above and firery realms beneath the asylum. If you are like me, and love the experience of horror-- and haven't yet checked this show out-- I highly recommend you do so. Season 1 is now available on DVD/BluRay and Netflix Instant Streaming.